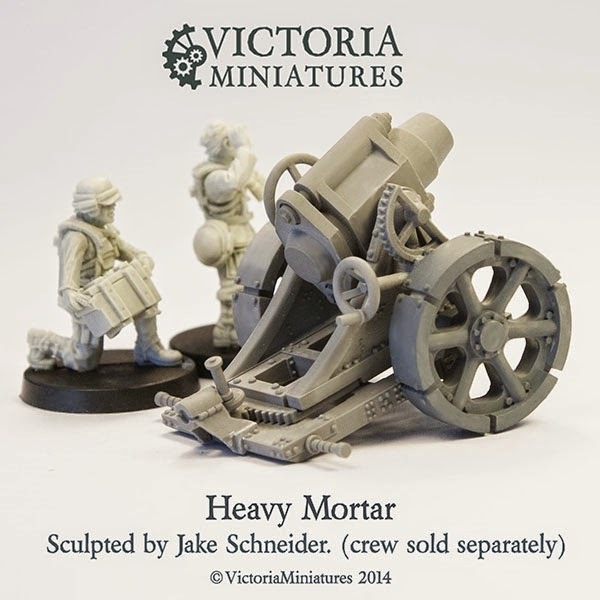 Minis Review: Victoria Miniatures New Heavy Artillery! Hi, Sc Mike here from Santa Cruz Warhammer. 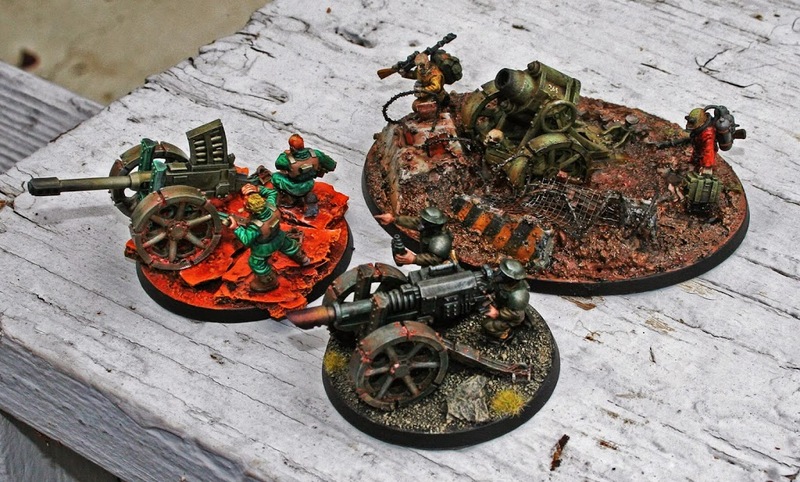 Recently Victoria Miniatures sent me a box of new resin heavy weapons for the Imperial Guard for review. I have always loved her commitment to one specific army (Guard) and the quality keeps getting better and better…. 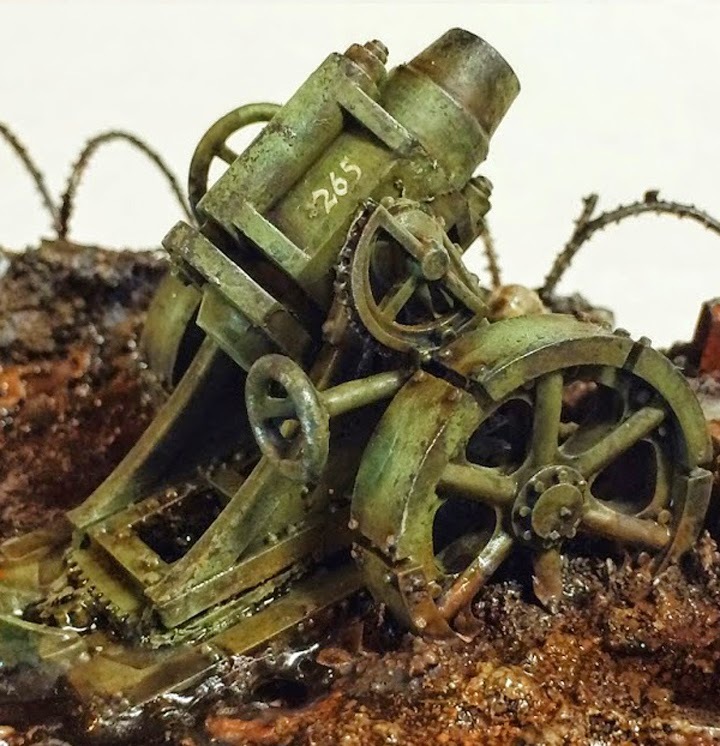 For our review, my two co- writers, SC John and Cornumortem, and I decided to build one of the models each without keeping each other in the loop, keeping in mind three different takes on the models: resin quality, modeling flexibility and cinematics. Here we go! 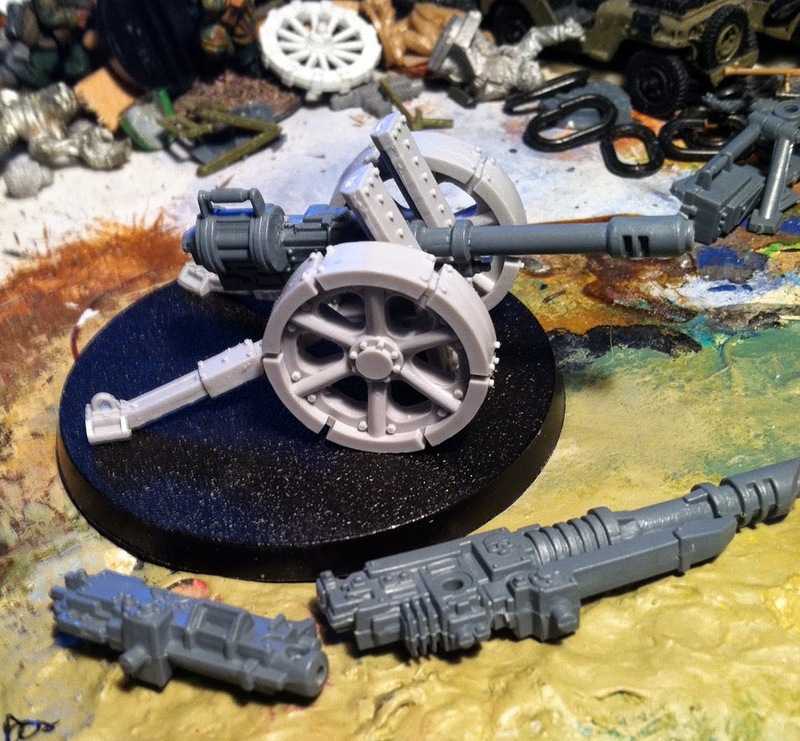 For my part of the project I assembled the autocannon kit and took a few heads and arms from the Penal Legion sprue to blend into a less heretical gun crew. The Autocannon fits together nicely, and including not only an extra clip but two different styles is a nice touch. 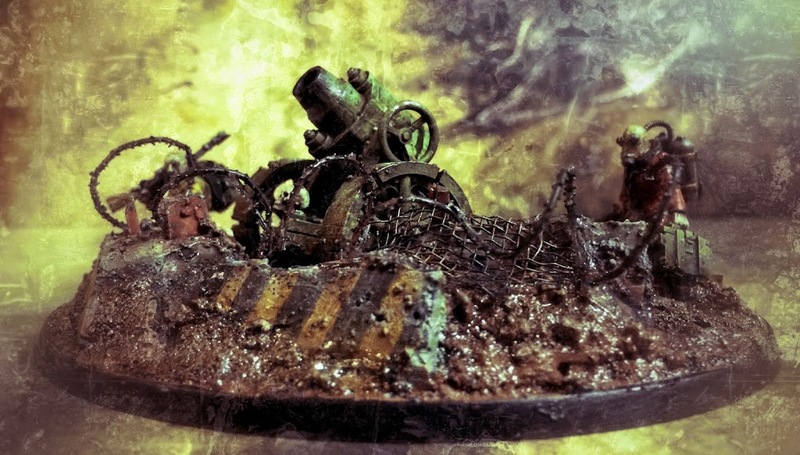 The crew sprue offers a generous helping of options, most of which you won’t find on other companies sprues so you can really spice up the monotony of your army. The kit isn’t without some small flaws: while minimal, you will have to clean up some mould lines. There were a few tiny casting errors on the parts I used, I had a little bit of flooding on one of the lenses the goggles of one of the heads I used, and there was a few miscast bolts on the gun carriage feet. However these are millimeter-sized errors, I probably wouldn’t have noticed them had I not been scrutinizing the parts for the review. Some great options for weapon arms are included in the crew set. The other thing that is immediately noticeable on unboxing is that the pieces are straight and not a warped mess of resin. Something that seems to be accepted among some resin junkies is that due to international shipping and temperature changes your pieces will arrive as a tangled mess. But as this little box from Australia to the US illustrates, it doesn’t have to be the case. While some of the aforementioned factors can cause warping during shipping, the real culprit is the resin casters rushing the process and removing the resin from the mould prematurely to save time and maximize profit. 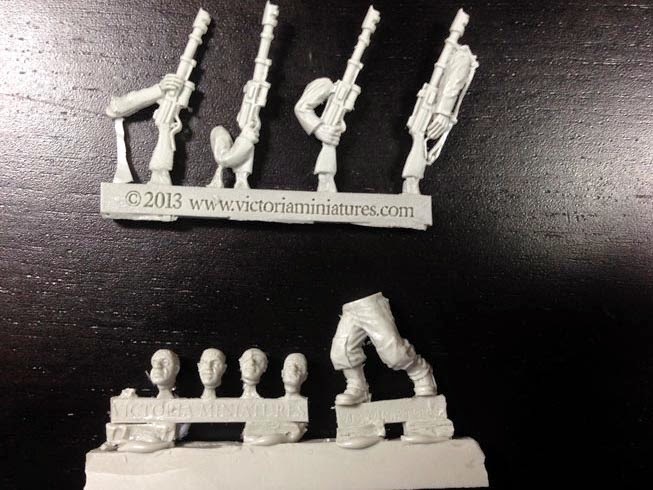 Seeing thin long bits like the rifles arrive without the need for correction speaks volumes towards the skilled casting and good quality control of Victoria Miniatures. 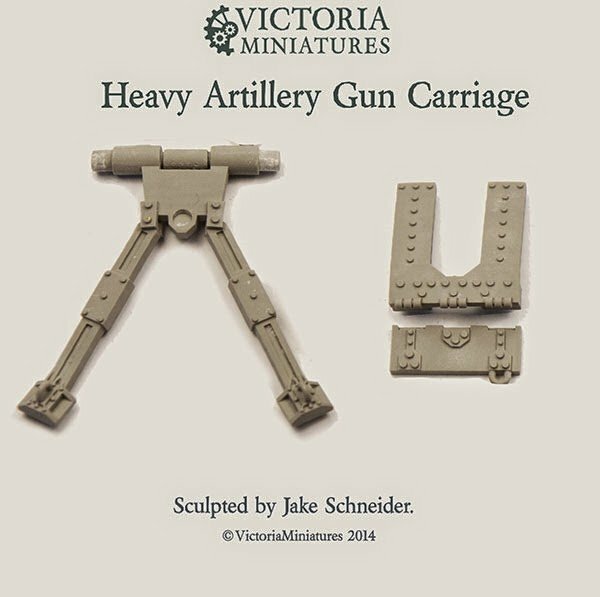 My review is going to be focusing on using Victoria’s gun chassis only with Games Workshop weapons for a Warhammer 40k Imperial Guard unit. 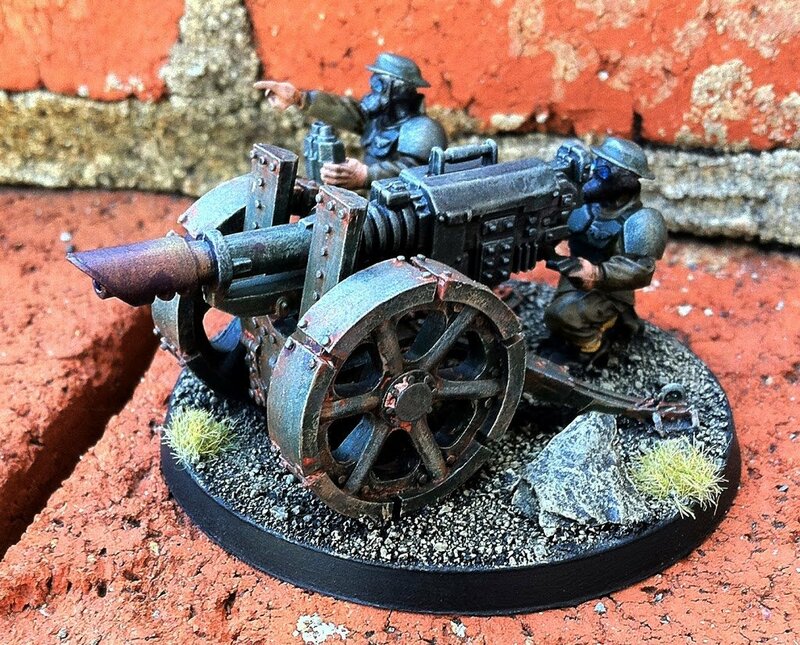 One of the important things for me, was to keep the Guard’s weapons as they are so iconic and help with the wysiwyg factor in a game, so my army uses GW weapons. 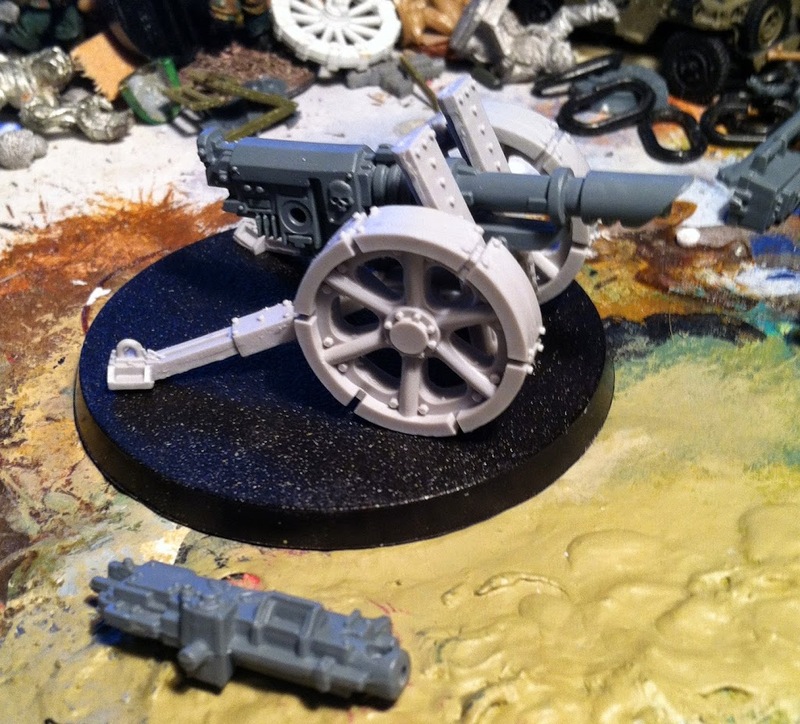 A million years ago or so, I decided that my Ardwick Guard army needed to have wheeled heavy weapons. Please read all about it here, and then come back and read on. So as I said in 2009, lets get some wheels on these guns, building my own chassis and sourcing wheels was a pain in the but and time consuming, luckily those days are over. 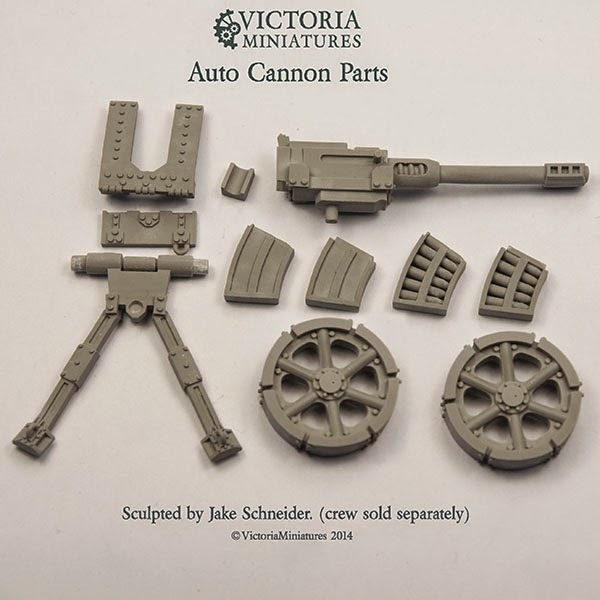 Victoria Miniatures sells this chassis and even some different wheel options and they are just the thing to finally get some wheels under your guard guns. You could even find more modern wheels with tires on them and just use the chassis, its a great deal for the price and for all the time it will save you making your own. 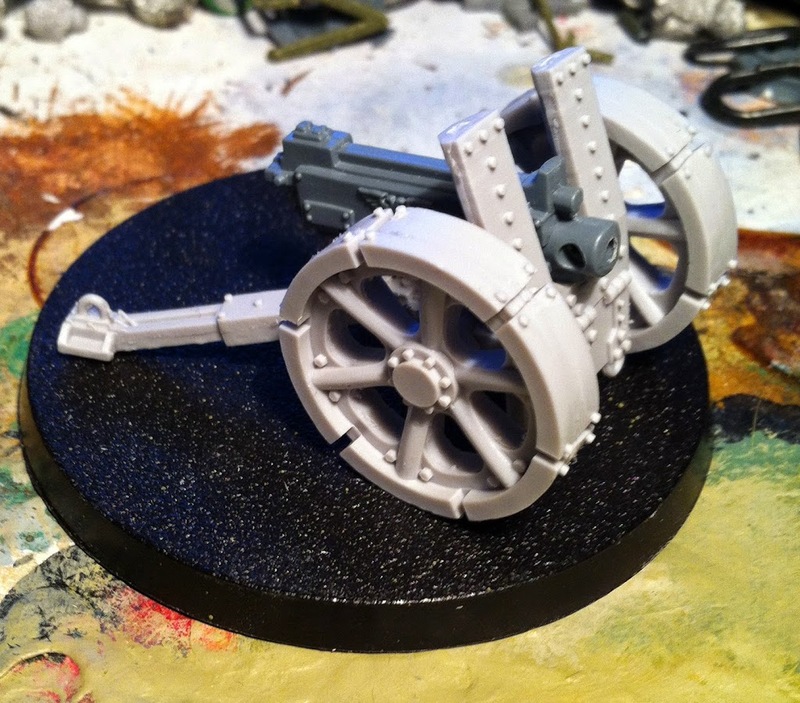 The chassis uses an unique mounting system for the Victoria guns, with a notch in the front and a peg in the rear, the deck of the carriage is angled, the Victoria guns sit just right, but if you just glue your GW gun down, it will point up in the air. So I just heated the resin in some hot water and bent the legs down a bit to level out the deck and was ready to go. You could also just make a shim for the back or cut and reposition the legs, I will leave that all up to you. 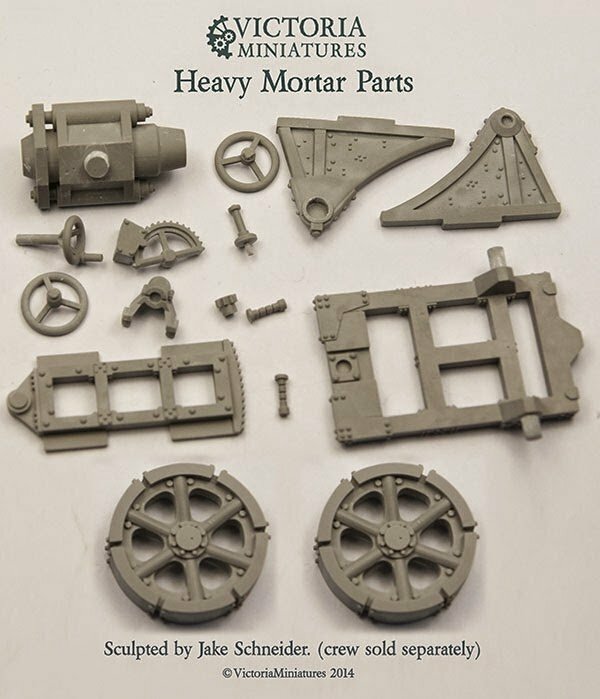 This is a great way to get more out of your GW heavy weapon sets, you can buy a chassis for each gun type and mount your Lascanon, autogun or heavy bolter on Victoria Miniatures gun carriage. If you get really slick you could mount them with little magnets and be able to change them around as you see fit. 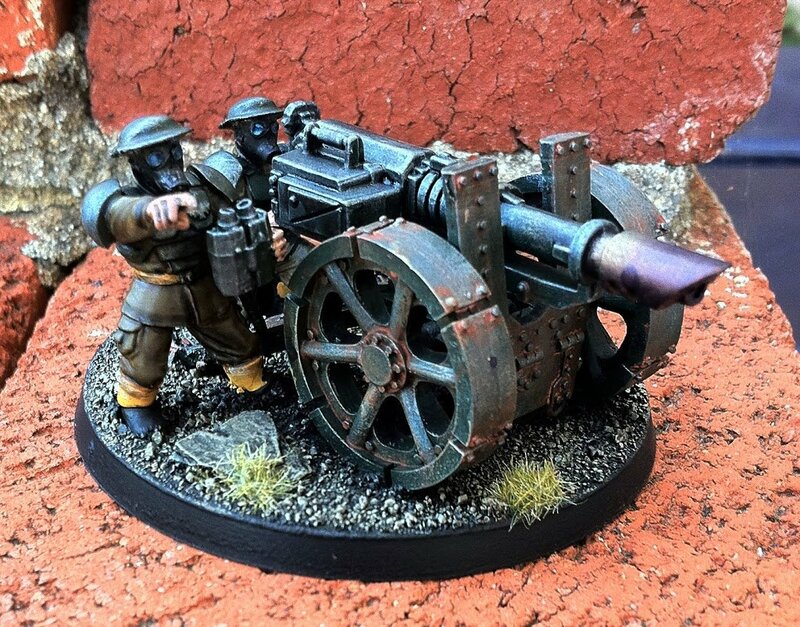 I knocked mine together with my GW bits and Westwind heads and painted it up like the rest of my Ardwick 23rd, I also added a touch of Secret Weapon rust pigment and this model was ready to join the ranks. 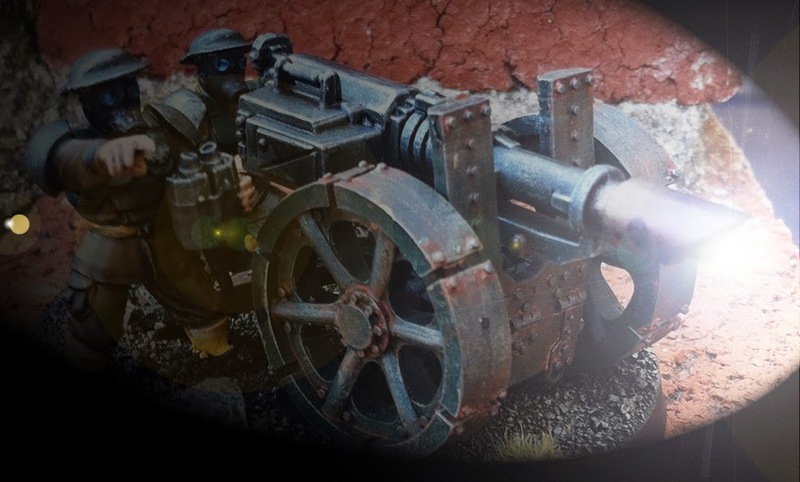 I was going to give my few cents on the cinematic look of the models and how much fun it is to work on the Heavy Mortar that Victoria released. As you can see, the design of the mortar is very crisp, very robust and very old fashioned looking. Like a lot of designs from the studio, it bears a WW1 look. 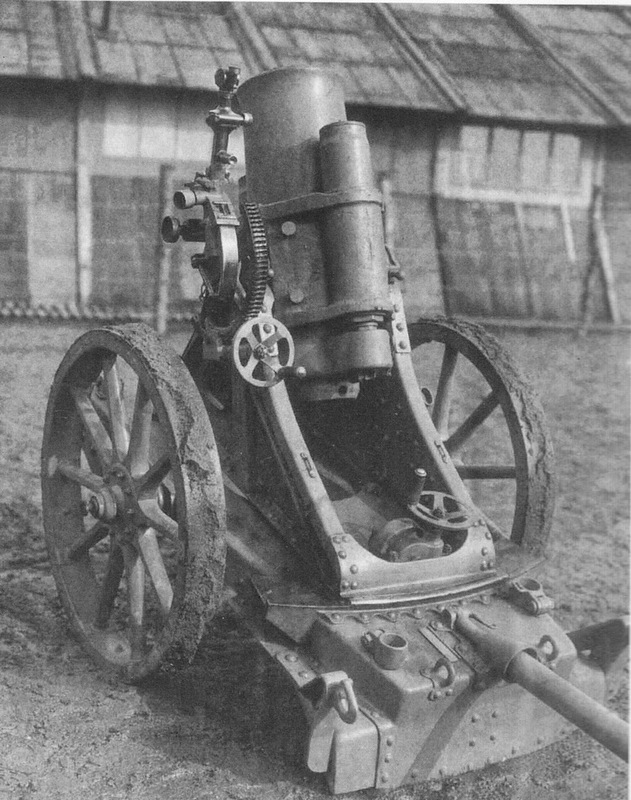 Check out this image, it seems clear that Jake Schneider, the sculptor of the weapons, took a liking to THIS gun, the 17 cm Mittlerer Minenwerfer, or German Medium Trench Mortar. Notice any resemblances? Of course! And why not? It’s a beautiful design, with the curved side panels, the spoked wheels, the gear wheels and the countless rivets. It really looks like a machine invented by by Jules Verne. 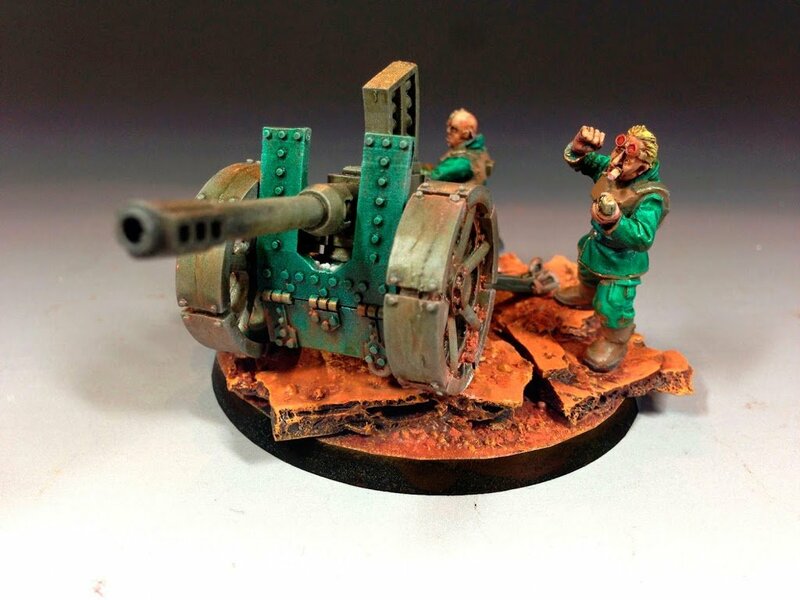 The resin model from Victoria Miniatures is beefed up a bit, with less tiny parts and enlarged big parts, like the wheels and the turning handles but it still has a really detailed feel. 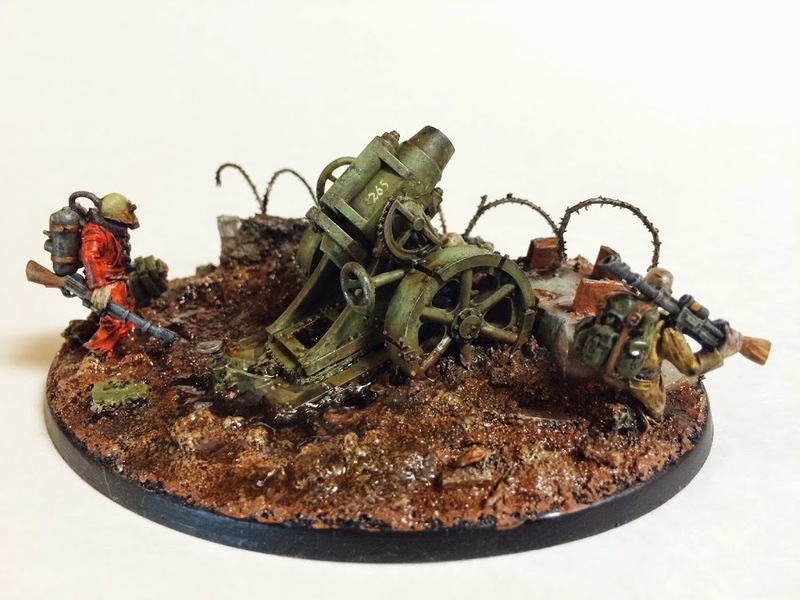 It looks 40K, but with a nod to the past. The actual kit is crisp and clean, it’s truly a joy to look at. The build was easy, but I did have to go online and look at the online tutorial, to make sure it all was put together correctly. Personally I think the model should come with a small paper guide on how to build it. Victoria has an image of the build on her site, so you can always print it out. Using a 60 mm base, the motar fills up pretty much the whole surface. With no options to add crew to that same base in a diorama style way, I abandoned the idea of a gaming model and instead opted for a small diorama. 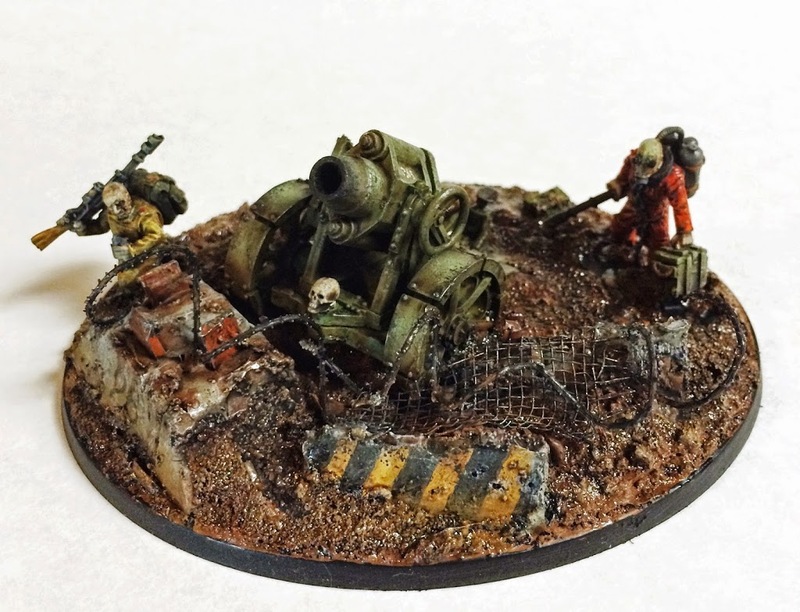 I used an oval flyer base from Games Workshop and created a trench scene. Here you can see the mold lines on the barrel of the mortar, but it was easy to clean up. There were also some moldlines on the wheel surfaces, those I sanded off. It’s part of modeling and I don’t consider it an error in casting. 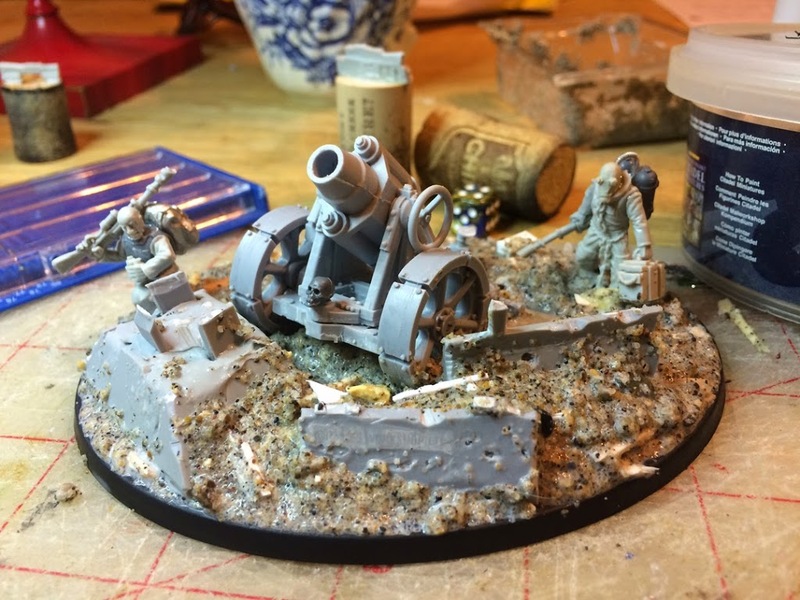 You can see, the Mortar is a pretty big model. It would fill the 60mm base pretty much all the way, which doesn’t leave much room for creating a small diorama on that same base. In the game the crew would be on their own bases of course. In closing, I personally think the models that Victoria Miniatures creates, really rank at the top. There is no other independent company that is so focused on the Guard, and because there is so much commitment on one army, the quality of the sculpts gets better and better. So many different options for arms, small arms, heads, torsos, gender (yes, there are female guard models!) and now great weapons. I can’t wait for VM to start getting into vehicles! In closing, the shot with all three models: you can see how versatile and visually interesting the sculpts are! 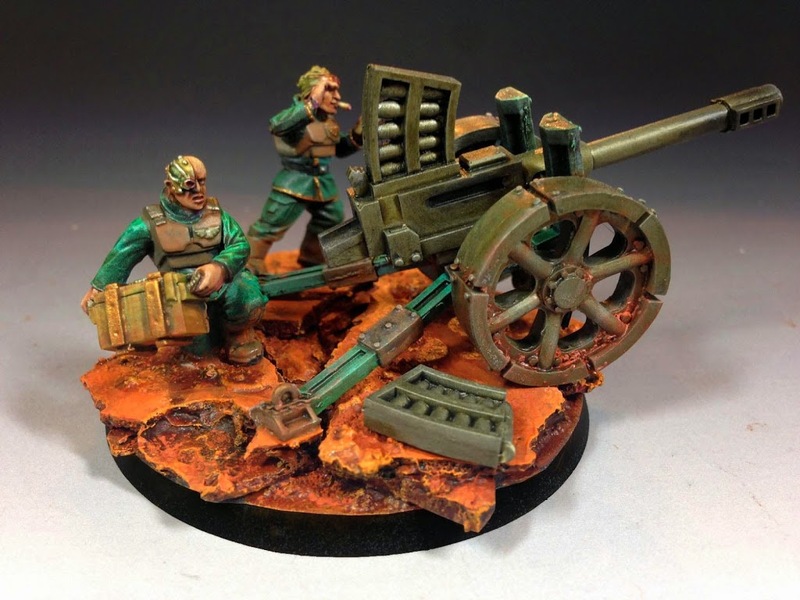 Great stuff – go support her at Victoria Miniatures. Hopefully you found this review helpful (and not too long…). We try to do the reviews thoroughly, since companies spend a lot of energy and money designing and producing them.